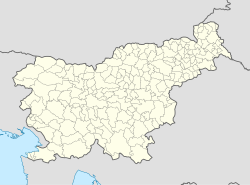 Žirovnica (pronounced [ʒiˈɾoːu̯nitsa]; German: Scheraunitz) is a small settlement in the valley of Žirovnica Creek, a tributary of the Poljane Sora River, south of Žiri in Slovenia. Although it is easily accessible by road only from the Žiri side, which is in the Upper Carniola region of Slovenia, it actually lies in the Municipality of Idrija in the traditional Littoral region. ^ Leksikon občin kraljestev in dežel zastopanih v državnem zboru, vol. 6: Kranjsko. 1906. Vienna: C. Kr. Dvorna in Državna Tiskarna, pp. 124, 126. This article about the Municipality of Idrija in Slovenia is a stub. You can help Wikipedia by expanding it. This page was last edited on 20 March 2017, at 04:46 (UTC).